This page makes the campus community aware of colleagues and students, who receive diversity-related honors, make diversity-related presentations, publish diversity-related articles/books/dissertations, and display diversity-related creative activities. The intention of this link is to serve as a resource and a connecter to advance inclusive excellence. 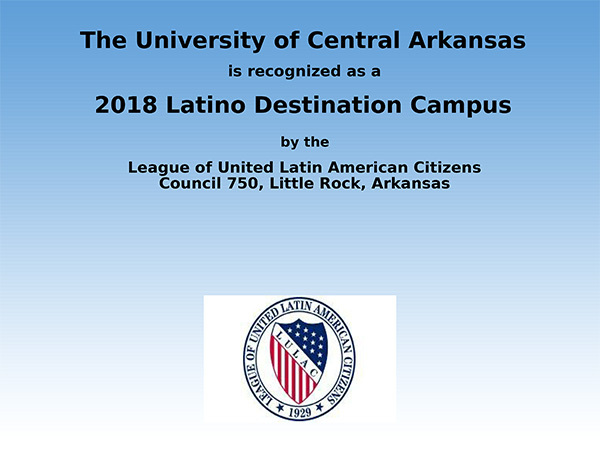 Established in Fall 2018, this grant provides opportunities to attract, affirm, and advance domestic, racial/ethnic minority faculty members of historically underrepresented groups at UCA that are not proportional and representative of their student counterpart or have little representation on the UCA campus. 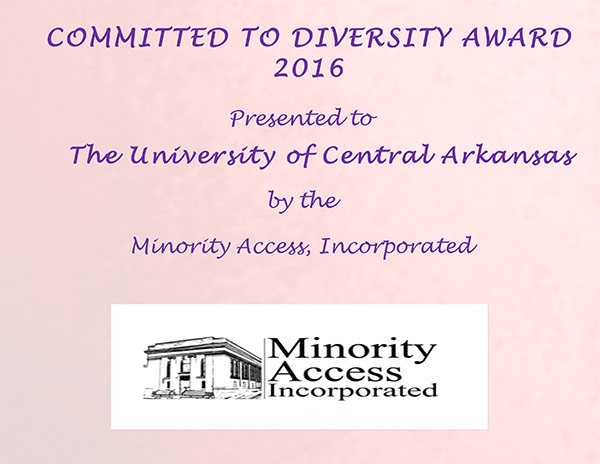 This year marks the third year for the Diversity and Inclusive Excellence Award. 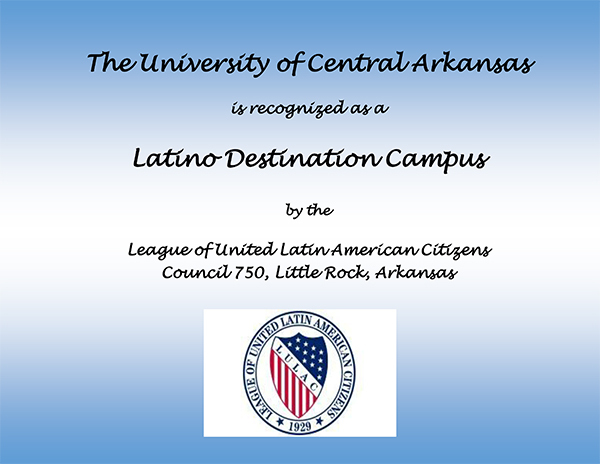 The conception of this award was put forth by the University’s Strategic Planning Committee and the Diversity Advisory Committee. This award recognizes individuals whose commitment to diversity and inclusive excellence on and/or off campus have made a significant impact on various ethnic groups and diverse communities in a positive way. These individuals have improved conditions at UCA and within the community that have enhanced society. Mr. Adriian Gardner, Speech Faculty in the Department of Student Transitions, exemplifies the care and commitment necessary for using the whole-person approach in his teaching, outreach, advocacy and research. In each of these areas, Mr. Gardner makes an outstanding contribution to diversity and inclusion for our campus and community. In teaching in University College, he embraces his role as a mentor for several underrepresented communities on campus. He works to ensure that his students are prepared for college-level success, particularly students in BMAC—the Black Male Achievement Challenge. In his outreach, he works across the campus community to ensure that others know the best practices for helping vulnerable students in their transitions. His engaging and disarming demeanor is perfect for Center for Teaching Excellence sessions, Student Transitions departmental working groups, and in University diversity training seminars. His dedication to respectful and inclusive advocacy is clear in his work serving the Office of Diversity and Community. In his research is part and parcel of his commitment to diversity and inclusion. Recently, he facilitated a national conference presentation on his methodologies and successes with focus groups for student success and retention of African American men college students. His dedication to diversity extends beyond a single population, however. Mr. Gardner has also given presentations for PRISM—an LGBTQ focused Registered Student Organization at UCA—and he is thoughtful and intentional in his outreach to international students. Additionally, as a colleague, he works to always respect and value diverse perspectives—regularly inviting colleagues to coffee chats, or to join him in seminar sessions to ensure that those perspectives are heard and shared. 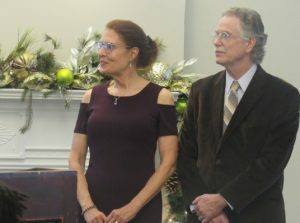 Emphasized in his letters of nomination and support, Mr. Gardner’s friends and colleagues see him as a “tireless” “advocate for marginalized students,” who “goes above and beyond” the call of duty. He is also known and respected for his “wit and homespun wisdom” which enable “him to develop deep connections” with those he serves. Dr. Donna Wake, Associate Dean in the College of Education, has fully committed herself to the ideals of diversity and social justice and this commitment is infused across all aspects of her professional career. As a professor, Dr. Wake encourages her students to broaden their understanding of multicultural education and ensures teacher candidates are fully prepared to teach in diverse and inclusive classrooms. One example of this is her development of a Social Justice and Education course. This course allows students to actively talk about and wrestle with ideas on racism, homophobia, ability discrimination, religious tolerance, and gender disparity. The intent of the class is to disrupt schools structures that perpetuate institutional disparity and inequity. Another example of Dr. Wake’s promotion of inclusiveness and diversity in her teaching is displayed in her Analysis and Practice of Teaching course. In this course she facilitates student field trips to urban schools with large minority populations, so that students have the opportunity to gain a deeper understanding of the inherent challenges and needs of these children. Dr. Wake’s field trips have been so successful, that they have been included in other courses. 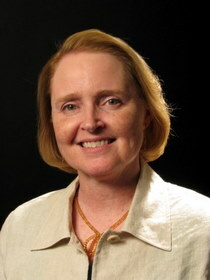 In her position as Associate Dean, Dr. Wake has developed and administered a yearly college diversity and climate survey and she analyzes college-wide data from the Multicultural Efficacy survey, which measures teacher candidates’ experience, attitude, efficacy, and belief statements in multicultural education. This data is critical to understanding how departments in the College of Education are impacting teacher candidates. Dr. Wake has also formed and tasked the Recruitment and Retention Committee with writing a 5- to 7-year recruitment and retention plan to specifically include language around current and future practices in recruiting and retaining diverse candidates in the College of Education. Jayda Williams, is a student with high participation in platforms that promote inclusiveness on campus. From actively volunteering in the Minority Mentorship Program, to being a member in the National Association of Black Men United and the American Chemical society, to being the president of UCA’s NAACP chapter, this student seeks opportunities to assist diverse populations and promote inclusiveness. Fellow for the University. In addition to this, she co-founded a scholarship to assist minority graduates from her high school alma mater. It is because of these, and many more achievements, that we are pleased to honor to Jayda Williams with this award. 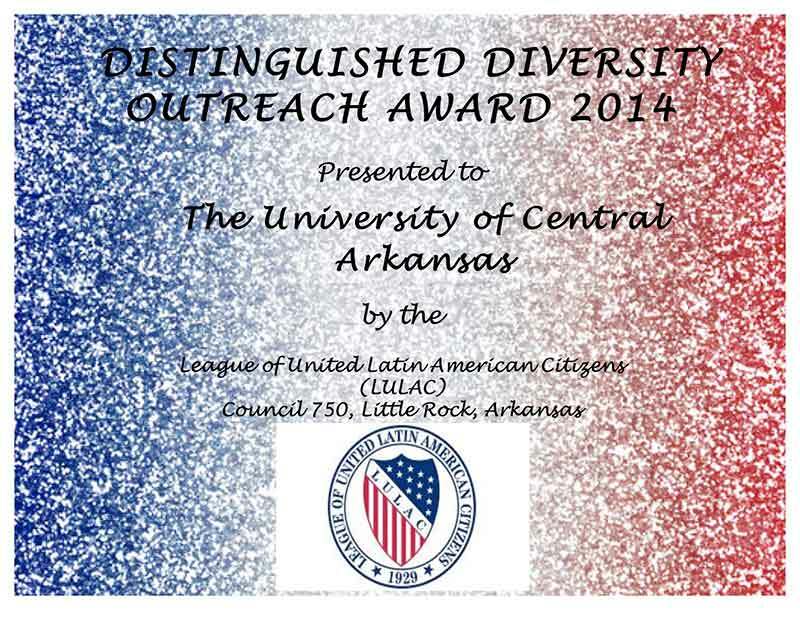 This year marks the second year for the Diversity and Inclusive Excellence Award. 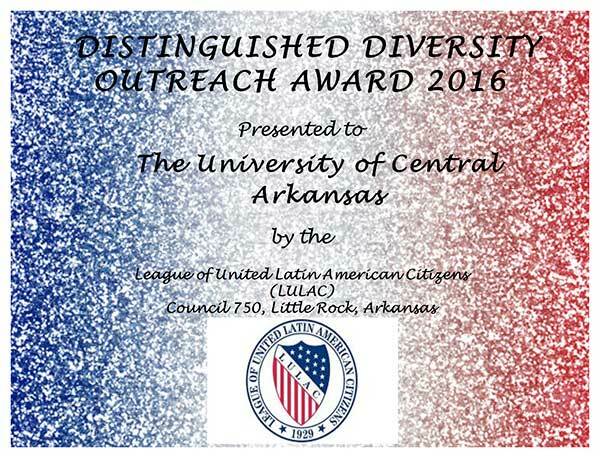 The conception of this award was put forth by the University’s Strategic Planning Committee and the Diversity Advisory Committee. This award recognizes individuals whose commitment to diversity and inclusive excellence on and/or off campus have made a significant impact on various ethnic groups and diverse populations in a positive way. These individuals have improved conditions at UCA and within the community that have enhanced society. As a scholar of Africa and its Diaspora and world history, Dr. Michael Kithinji invests his critical perspective, classroom practices, and service activities in work that combats negative myths and stereotypes about Africa and the non-Western world. Dr. Kithinji, Assistant Professor in the Department of History and Director of the African and African American Studies Program, has demonstrated a consistent commitment to encouraging campus wide diversity and inclusion efforts since he joined the faculty in 2013. At the heart of his work is an emphasis on challenging the intellectual opportunities for students to become more culturally competent by offering classes such as Pan-Africanism and the Liberation Struggle, Apartheid South Africa, and Modern Africa. He is currently organizing a study abroad opportunity to Tanzania to help students expand their sense of self within a global community. Dr. Kithinji also invests in students outside of his classroom by participating as a frequent guest speaker on campus, supporting the involvement of students in the Faulkner County NAACP, and serving as an involved member of student retention efforts for African American men. Most recently, Dr. Kithinji played a key role in the establishment of the African/African American Studies Society, fondly known as AFAM. Through this student group, students have opportunities to participate in educational trips and more speakers and events related to minority cultures occur on campus. Overall, his efforts are building the secure foundation for a bright future for the AFAM Program. Colleagues note that Dr. Kithinji is hardworking, dedicated, resourceful, and patient—his ability to use limited resources to expand the cultural viewpoints on our campus from the local to the global is laudable. This is the first year of this award. It recognizes an individual whose commitment to diversity and inclusive excellence on campus and/or off campus has made a significant impact on various underserved groups in a positive way. This individual has improved conditions at UCA and within the community that have enhanced society. 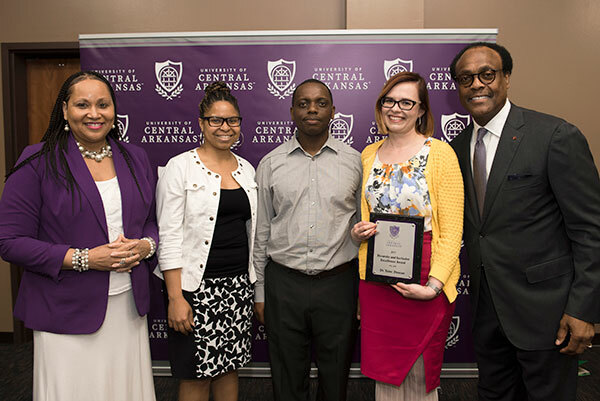 The recipient of the inaugural Outstanding Diversity Outreach by a Student Award has been active in bringing awareness and cultural activities to UCA and to the Conway community. She has selflessly served organizations such as the Student Government Association, the Minority Mentorship Program, the Order of Omega Honor Society, and the UCA National Panhellenic Council. Hershila has also actively served as a Presidential Leadership Fellow, a UCA Ambassador, a peer coach, and much more. Our first recipient was instrumental in the development and implementation of the Spirituality Speaking Series, which increases understanding of the religious diversity on our campus and the HOLI Festival of Colors that celebrates good over evil. At HOLI Festival, everyone comes together for an afternoon of dancing and throwing of colored powder. Considering that the end of the event leaves everyone covered in colored powder, signifies an acceptance of differences while it also honors unity, friendship, and healing. Much like the HOLI Festival, Hershila honors diversity and inclusive excellence as well as unity, friendship, and healing. 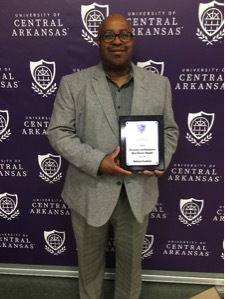 Recent graduate, Dr. Barrett Petty was selected as the recipient of the 2017 Association of Teacher Educators Distinguished Dissertation in Teacher Education Award for his dissertation titled Factors That Contribute to the Completion of Programs of Study at Arkansas Institutions of Higher Education for African American Males. 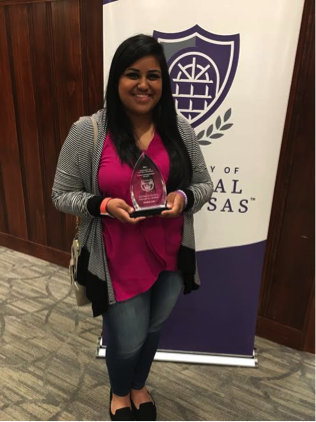 The Theta Lambda chapter of Beta Alpha Psi chapter at the University of Central Arkansas earned two first place awards at the organization’s Southwest Regional meeting in Dallas, Texas, on Saturday, February 25, 2017. Emelyn-Doriane Djoké of Côte d’Ivorie and Tuan Nguyen of Vietnam competed in the Community Outreach category of Best Practices using their project, “Diversity in the Accounting Profession.” The students competed against three other regional teams and won the competition. The students who participated in the competitions earned the right to compete at the national meeting this August in Anaheim, California. 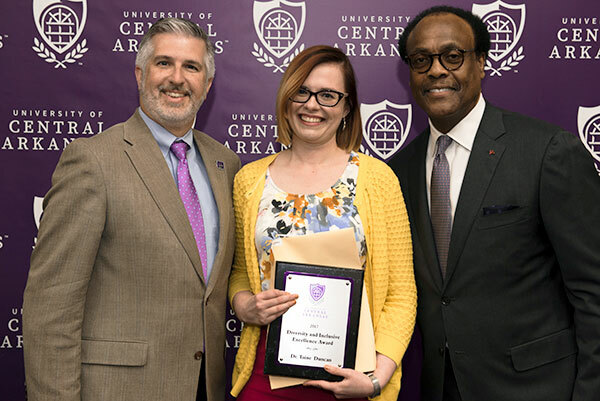 The UCA Department of Accounting received contributions from BKD, LLP which allows the students to travel to the southwest and annual conferences. The UCA Student Government Association and the UCA Diversity Office also covered a portion of the registration fees for the conference. Beta Alpha Psi is an honor organization for financial information students and professionals with over 300 chapters on college and university campuses. The Theta Lambda chapter is identified as a superior chapter by the organization for its commitment to professional and service hours. If you have any questions or comments, please contact our chapter’s faculty advisors, Dr. Connie McKnight (cmcknight@uca.edu; 501.450.5076) and Dr. Karen Oxner (koxner@uca.edu; 501.852.0028). 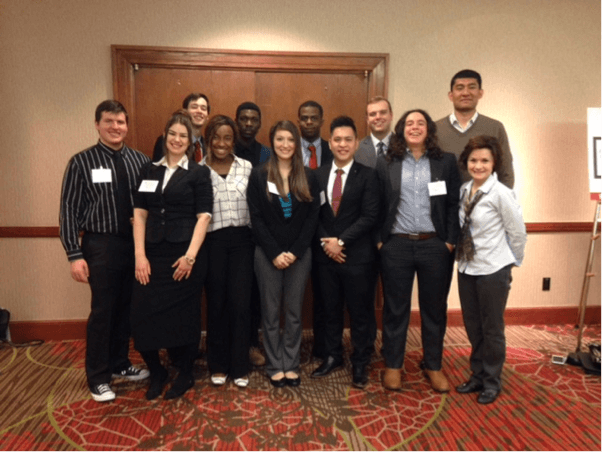 Pictured left to right: Jacob Hoelzeman, Anastasiya Klimiankova, Nathan Scheuter, Emelyn-Doriane Djoké, Alyman Ouattara, Kylie Garrett, Obed Onyemakonor, Tuan Nguyen, Johnathan Long, Jean Piere Leon Chavez, Sultan Faretdinov, and Dr. Karen Oxner. This year marks the first year for the Diversity and Inclusive Excellence Award. 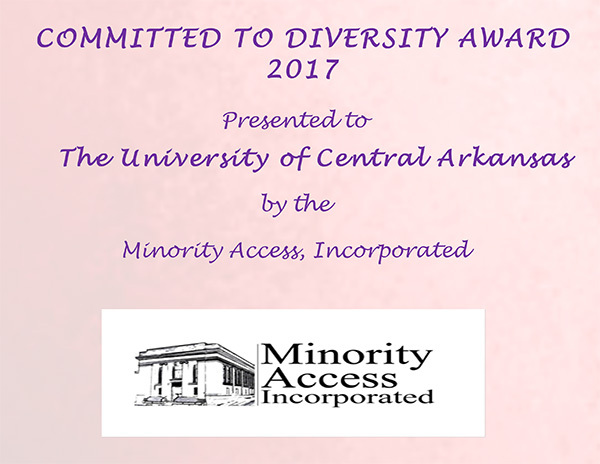 The conception of this award was put forth by the University’s Strategic Planning Committee and the Diversity Advisory Committee. Vice President Ronnie Williams was named a National Role Model by Minority Access, Inc. He was honored for being a role model and father figure to many, offering guidance, insight, and wisdom. Throughout the years, alumni who are now educators at every level, physicians, attorneys, and the gamut of professionals have returned to campus to connect with him and to validate his positive influence on their lives. He has persevered over the years to initiate critical conversations with courage, conviction, and kindness. He is a treasure to the University of Central Arkansas. Dr. Angela Webster was also recognized as a National Role Model by Minority Access, Inc. She works diligently to assist following generations of students in obtaining graduate degrees. She serves as an instructor for independent, guided courses for diverse doctoral students and serves on master’s thesis and doctoral dissertation committees of diverse students. 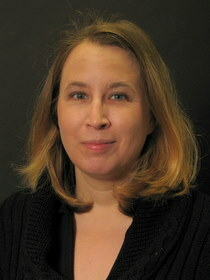 She recruits and mentors diverse undergraduate and graduate students as well as diverse faculty. She has also initiated diversity-related campus programming and has secured grant funding to advance inclusive excellence. 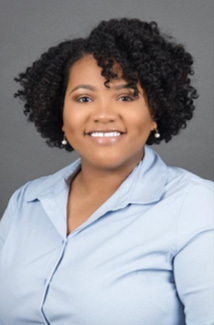 Edayshia Tank, a graduate student in the Psychology Department, became a fellow in the inaugural year (2015) of the Minority Fellowship Program in Services for Transition Age Youth (STAY). The fellowship is under the auspices of the American Psychological Association, the Substance Abuse and Mental Health Services Administration (SAMHSA), and the Department of Health and Human Services (DHHS). Nancy P. Gallavan, Angela Webster-Smith, & Barrett Petty (2015, February). Obtaining a baccalaureate degree: How high school GPAs and ACT scores affect African American males. Association of Teacher Educators. Phoenix, AZ. Angela Webster-Smith (2015, March). A six-point model of diversity and inclusive excellence for academic human resources. National Association of Diversity Officers in Higher Education. Washington, D.C.
Barrett Petty (2015). Factors that contribute to the completion of programs of study at Arkansas institutions of higher education for African American males. Doctoral Dissertation. The University of Central Arkansas. Angela Webster-Smith (2015). Racial identity. In Sherwood Thompson’s Encyclopedia of Diversity and Social Justice. (pp. 592-596). Lanham, MD: Rowman & Littlefield. During Fall 2015, students from RELG 1320 World Religions classes visited Little Rock to meet with members of the Central Arkansas Hindu community at the Shri Swaminarayan Mandir (temple). Members explained the customs surrounding the Hindu festival of Diwali and discussed the temple’s many community activities and functions. Dr. Jim Deitrick and Dr. Julia Winden-Fey accompanied the students. Funding for travel and for the Indian cuisine sampled in class was provided by a “Deep Learning” grant from UCA’s Residential Colleges. For more information on the mandir, please see http://www.baps.org/Global-Network/North-America/LittleRock.aspx.